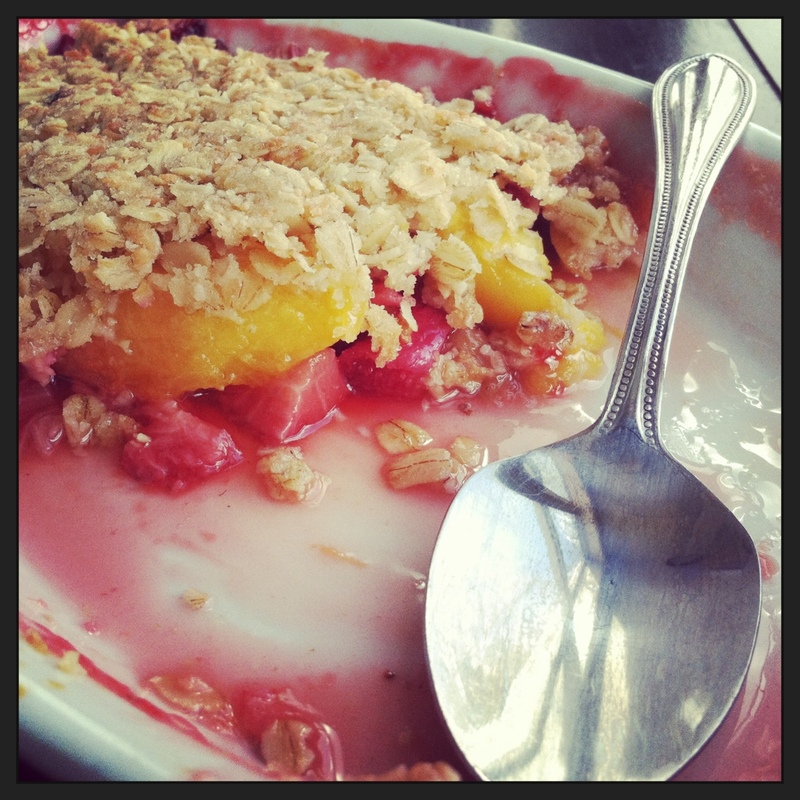 Strawberry Rhubarb Peach Crumble. [springtime treats!] | Eat More Plants. Gardening is geeky, completely geeky, but if you love food, growing it yourself is the way to move forward. I don’t follow many celebrity type chefs (Geoffery Zakarian and Alton Brown are my favorites) but I love this quote. I think it is so important to know where your food comes from. Growing it yourself eliminates all questions. It’s nice to see the efforts that Jamie Oliver makes to bring awareness to what’s being served to children in school. Many parents don’t think about it and take for granted that the schools have their child’s best interest at heart. While this is true in many aspects, it’s not so with the cafeteria food. I remember reading that pizza was acceptable as a vegetable to fill the food pyramid quota for school lunch. Sad. This time of year excites me, mainly because of all the things at the co-op that I haven’t seen since last year! Rhubarb and fiddle heads are two things that remind me spring is in full effect. 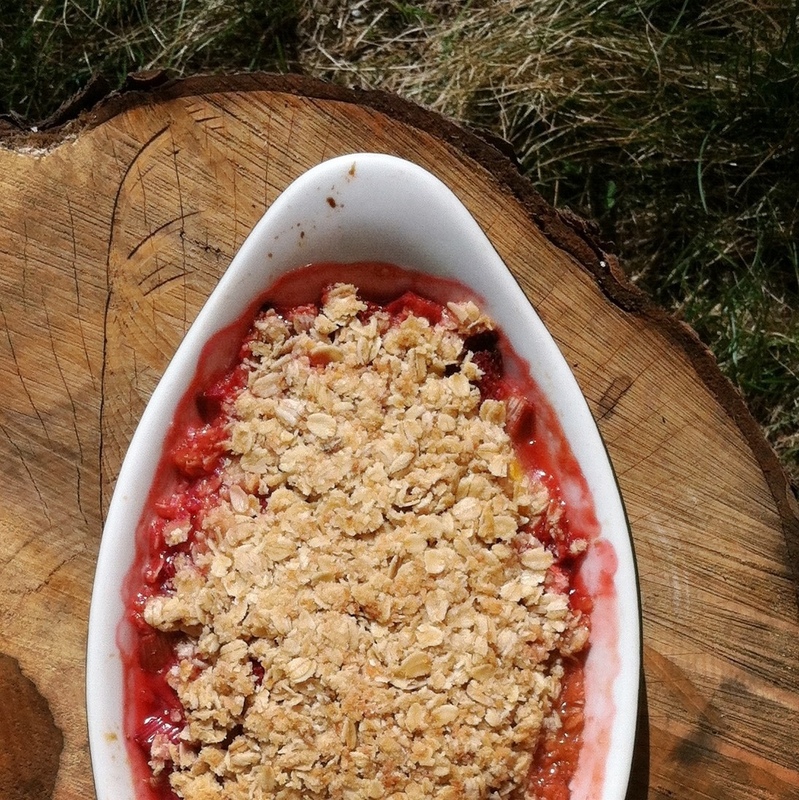 I bought a bunch of rhubarb stalks and a quart of strawberries having a crumble on the brain. I also found some peaches I had frozen since last year and decided to throw those in as well. Great combination. I made a simple gluten free oat crust for this; it literally takes minutes to prepare this whole pie and it’s so delicious. I make fruit crumbles a lot in the summer time, making different combinations as the different fruits come into season. Mix all filling ingredients in a large bowl and pour into your pie dish. I used an oblong shaped dish and had to press my fruit down firmly to fit it all in. An 8×8 dish would work fine or you could split it up into a few smaller ramekins if desired. Mix all the crust ingredients, except cinnamon, in a clean bowl and make sure everything gets well incorporated. Best to use your hands here. Crumble the crust on top of the filling, trying to cover the fruit completely. Bake your pie at 350 for 25-35 minutes. When you start to see the fruit bubbling around the edge of the pan and your crumble is slightly golden, it’s time to take it out. Sprinkle with cinnamon before serving, whipped (rice/coconut/etc.) cream if you like it. Let cool, if you can resist…enjoy! I spend a good part of my day upside down. Sometimes it’s good to change your perspective. 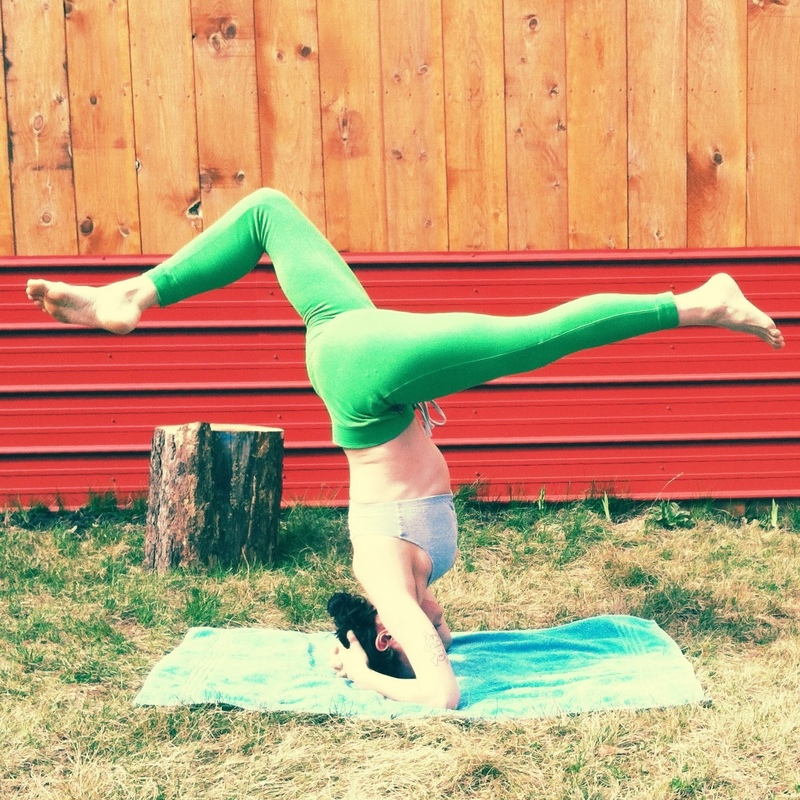 Inversion poses send blood to your brain, reducing stress and calming your whole being. I am a HUGE fan of rhubarb and am so excited it’s their time to shine! I can’t wait to try it. I haven’t had rhubarb with peach before, but it seems like a winning combination. I never had it before either! Peach & strawberry are one of my favorite summer smoothies, I figured rhubarb is versatile enough to jump in there too. It was sooo good.